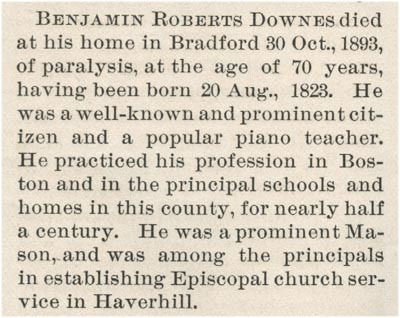 Benjamin Roberts Downes died at his home in Bradford 30 Oct., 1893, of paralysis, at the age of 70 years, having been born 20 Aug., 1823. He was a well-known and prominent citizen and a popular piano teacher. He practiced his profession in Boston and in the principal schools and homes in this county, for nearly half a century. He was a prominent Mason, and was among the principals in establishing Episcopal church service in Haverhill.